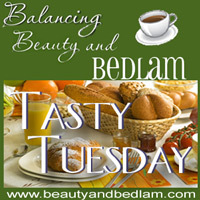 Tasty Tuesday – What's on Your Wish List? This weekend, I wandered into William Sonoma while I was waiting for my son. Do you know that it has been a few years since I have been there and now I remember why I stay away. It gives me a serious case of the “gimmies.” I just love all things kitchen gadgetry, and that store is a slice of heaven for the foodie in me. Am I the only one who could just spend hours looking at kitchen gadgets? It kind of makes me think I am getting old, like when I get excited about the thought of a new vacuum. I love the demos at William Sonoma and definitely realized I “needed” the filled pancake pan. Yes, I “needed” it and I didn’t even know it existed before Saturday. 😉 The guy was definitely doing his job because a bunch of other people realized that they couldn’t live without it either, especially at half price. I then picked up and dreamed about a kitchen full of Le Creuset cookware that so many of you recommended a few months ago when I asked for suggestions. What impressed me with that recommendation was that even though it was pricey, so many of you mentioned it had been handed down and still going strong. I love the thought of that generational legacy within the kitchen. Ok, so I admit, it’s a want, not a need, but a worthwhile investment, none the less. After ogling each item, I left…empty handed because any of my fun kitchen toys are coming from amazon and the swagbuck gift cards that I have earned. I’ve been loving my new Better Homes and Gardens cookware, but I am still in search of a large skillet, which is one of my daily use pans. I found out that William Sonoma is offering 20% off all Cookware when you enter coupon code WSCOOK20 at checkout (through December 12), so I am looking into my options. As we all think of things to buy for everyone else, I’m curious as to what one kitchen type gadget would you put on your Wish List? I think it would be fun to read some of your suggestions. I’m in the midst of round two of our holiday giveaway bash and you wonderful Tasty Tuesday foodies are going to love some of these giveaways. Also, don’t forget the 3rd Annual Progressive Dinner. Come link up your favorite bread recipe on Friday. Lisa Leonard 5 – $50 Gift Cards for her jewelry because I can wear it when I am cooking and feel oh, so stylish. I’ll be posting more giveaways this week, so check back for my Holiday Giveaway Bash updates, but now I can’t wait to see what you have been cooking up for this Tasty Tuesday Parade of Foods. If you want a really good skillet, you might look at one of the local restaurant supply stores. There is Jacobi Lewis in Greensboro and Carolina supply in Kernersville. I have bought pans from both of these places and love them. I have a stainless 5 qt that I cannot live without. It’s not a skillet in the classic sense, but you could find one there, I’m sure, and the prices are great. The kitchen item that I most want for Christmas is a Cast Iron Skillet. I also would like a hand held food saver with a mason jar attachment. All I want for Christmas is a new apron! Well… and maybe a mini-bundt pan. Thanks for hosting Jennifer! I think I might like a rice steamer. And I have always wondered about what it would be like to have a bread machine. Williams Sonoma is like the playground for me. I run around in complete amazement at all of the beautiful kitchen gadgets. Love wandering kitchen stores! My favorite in town in The Extra Ingredient! They run tons of great specials on pans each month so check them out. I’m in the market for some new ones so I recently had Martha go over all 4 lines they carry in depth. OK, so I want them all! A good skillet is very important! I went cheap about 6 years ago on my pans and I’m regreting it. Better to spend and get good that lasts forever! Love the idea of passing them down!!! Oh I finally moved away from “that” store. Thank goodness, it always got me into trouble ;). Now I just look through the catalog and dream. I have the same thing on my wish list as you! I want the big ‘ole All-Clad pan. The do-it-all, so I don’t have to pan…they make those right? I have been wanting a food processor! One of the really, really nice ones. But I couldn’t afford it so I just bought a cheaper one. It’s still better than the one that I had, I have yet to use it, I’m excited! I need something to CHOP! William Sonoma has MANY wants that I want, not needs. Oh my – how do I choose just one?! I’m a kitchen gadget junkie! I think the top of my list would be a panini press – or maybe one of those squeeze cookie presses – or a digital candy thermometer – or….okay, okay! I’m stopping now! For some reason I only have 1 9″ cake round. I would probably wish for a set of 3…every time I make a layer cake I have to bake it in stages…I wonder what I did with the other two rounds! Another AWESOME thing is to give cloth napkins, placemats and dish towels. We don’t use paper towels in the kitchen (and I can’t wait to finish our paper napkins). Can’t wait to try all these new recipes!!! Linking up! thx! I’d love panini press but I’m already in my bigger clothes so I know it would be bad news for me. I’d also love a stainless steel saute pan…the non-stick ones just can’t put up with the abuse we (apparently) dole out here. My number one all-time favorite kitchen gadget is my mini processor from Cuisinart. It’s a workhorse, fast and easy to use and clean. Highly recommend it. i’m thinking of buying a candy thermometer to fry some homemade doughnuts on artisanbreadinfive. You would appreciate some these goodies for your family. We hardly ever buy doughnuts and my children adore them, but I don’t want to pay full price for those jelly/cream filled kind so I’m going to try making them. I love kitchen gadgets too! I love to shop in Williams Sonoma, Sur la Table, and The Extra Ingredient, especially during the holidays when all the stores smell like cinnamon and coffee! It is amazing how many things you know you need even though you just found out about them! However, I am slow to buy kitchen utensils and appliances if I know that I won’t use them very often. I have, though, realized that I would really like to have a hand mixer. There have been so many times that one would have come in very handy. I think that is what I am going to ask Santa to bring me (and some very sharp knives would be appreciated too!). I just got a Kitchenaid Artisan Mixer. DH got a great deal in Kohls witha rebate and because they had messed up another order he had online he got a even bigger discount. He talked to his dad and both used the same discount to get 2 of those, so my MIL got a red one and I got a blue one.